It is with a real sense of pride that we are able this week to report the first of our Stormforce 1650 boats entered service as the new Port of Belfast Pilot Boat. 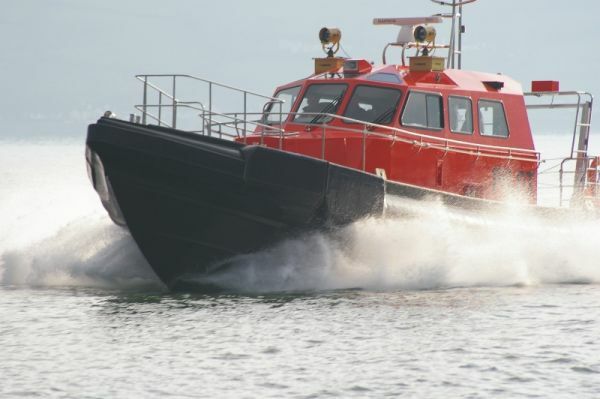 Redbay Boats successfully tendered and won the contract to supply Port of Belfast with their next generation of Pilot Boats back in January 2014, now 12 months on the first boat the Captain Michael Evans enters service. Belfast Harbour run a fleet of three Pilot Boats which until now have all been based on the Halmatic 42 semi-displacement design so the new Stormforce 1650 is quite a departure in terms of design and specification. Aside from being 12 foot longer the new boat is for the first time powered by Scania engines, the previous vessels had all been Volvo powered, it has crew seating for 12 persons, the older boats only had six and it has a generous under deck accomodation space with a toilet, galley and crew mess. The vessel has been developed in consultation with the the Harbour operations team and the results are pretty spectacular. Apart from the improved seakeeping the vessel affords the crews much superior visibility and comfort which will make their very difficult and challenging job more tolerable. The vessel also has amazing alongside ship charcateristics and with a totally new fender system it is protected by a very durable bumper system which allows it to collide in a controlled fashion with the ships that it needs to board. It is anticipated that the boat will do about 1500 hours a year in very tough and demanding conditions and to that end it has been fitted with the very best commercial equipment available in the marketplace today. In the photos the vessel can be seen adorned with 2 x Seematz searchlights, these are more usually seen on the top of ships entering the harbour but demonstrate perfectly the commitment to quality of equipment selected. The vessel has been finished in the Belfast Harbour corporate colours and I think that you would agree the results are pretty spectacular. The harbour Red is both striking and functional as it makes the vessel very visible in lower light conditions. Redbay Boats would like to thank Belfast Harbour for the assistance and support in developing this wonderful craft and wish every succes with the new boat into the future.